Falls Festival returned to Fremantle for the third time with a stacked line-up of music and arts. The heatwave failed to deter thousands from descending upon Fremantle Oval to bask in the best international and local acts that the weekend had to offer. 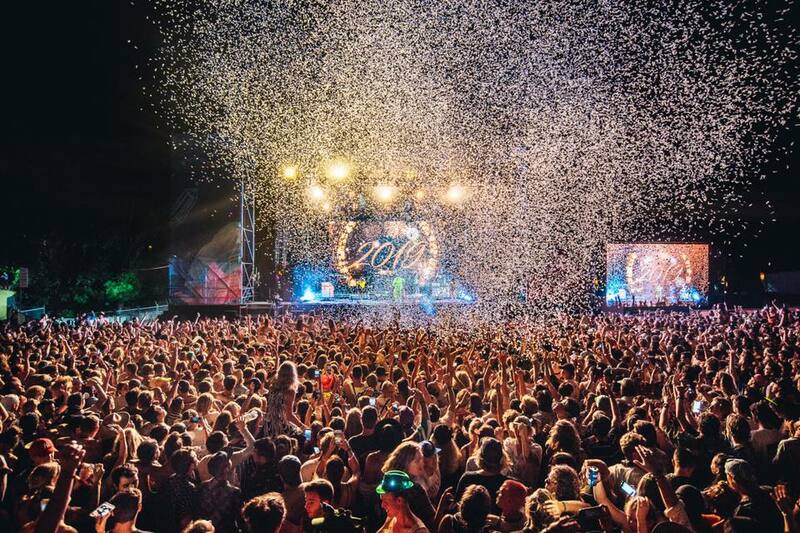 For those who missed out on the jam-packed weekend, here are the highlights of Falls Festival Fremantle 2019. Dean Lewis didn’t let a sparse discography get in the way of sufficiently warming up the crowd. In addition to his hits ‘Waves’, ‘Be Alright’, and ‘Lose My Mind’, the Australian songwriter surprised the crowd with a rousing cover of Oasis’s ‘Don’t Look Back In Anger’, topping off a pleasant set. Festival favourites Flight Facilities enlisted the help of Owl Eyes and Ric Rufio to bring some of this generation’s most recognisable dance tracks such as ‘Crave You’, ‘Clair De Lune’, and ‘Sunshine’ to life. Dressed in their trademark pilot outfits, the Sydney duo’s set was electric, particularly with their iconic and sprawling eight-minute ‘Clair De Lune’ unfolding as the Fremantle sun set. Anderson Paak & The Free Nationals are no strangers to Fremantle, pulling off a whopper of a set just one year ago at Laneway Festival 2018. It quickly became evident that no artist is more equipped to close the first day festivities than Paak. Paak’s one-hour set was interspersed with crowd surfing, smoke jets, seductive back-up dancers, and of course, drum solos that displayed his unparallelled skill. Spurred on by the impressive crowd, Paak and his band returned to the stage for an encore of ‘Dang!’, honouring his close friend, the late Mac Miller. A newcomer to the Australian music scene, Odette pens vulnerable melodies that are often interspersed with spoken word omissions. Her powerful vocals and wide range ensured that despite her early set time, the Sydney singer-songwriter delivered a moving set that set the tone for Sunday’s festivities. Brisbane four-piece Cub Sport have been enjoying a meteoric rise in the Australian music scene for months now. In addition to their distinctive synth-heavy indie-pop sound, the members are advocates for the LGTBQIA community. Lead singer Tim Nelson introduced the debut of the band’s new single ‘Party Pill’ by telling a story about how his romance with fellow member Sam Netterfield began, ensuring their set was both uplifting and memorable. The searing mid-afternoon heat didn’t stop an impressive crowd from flocking to Ocean Alley’s set. With their surfy, reggae fusion sound, the Sydney five-piece were born to play summer festivals. Hedged as a favourite to take out the #1 spot in triple j’s Hottest 100, ‘Confidence’ was a crowd pleaser, as were ‘Knees’, ‘Yellow Mellow’, and ‘The Comedown’. Young gun Ruel had the crowd eating out of his hand with his mature vocals and endearing stage presence. At just 16 years of age, the precocious up-and-coming talent is light years ahead of his age with his mature, contemplative lyrics that meditate on friendship and love. His husky live vocals brought crowd favourites such as ‘Dazed & Confused’, ‘Younger’, and ‘Don’t Tell Me’ to life, ensuring this is definitely one musician to watch. It’s no surprise that national treasure Vance Joy drew one of the biggest crowds for his evening set. There are few other singer-songwriters in the current Australian music scene that combine simple melodies with poignant storytelling as flawlessly than this beloved Aussie. Vance Joy drew from his two albums and EP to perform everything from the expected triple j favourites such as ‘Riptide’ and ‘Saturday Sun’ to the lesser-known yet equally powerful ‘Mess Is Mine’ and ‘From Afar’. Swedish folk duo First Aid Kit were a wholesome choice to close the festival. Renowned for their lush harmonies and intricate songwriting, the talented sisters were the refreshing antidote to the alternative festival closers, Golden Features. Oozing talent, the sisters took to the stage armed with their guitars and a quirky sense of humour. They even called upon Fremantle’s own Stella Donnelly to join them onstage for a cover of Neil Young’s ‘After the Gold Rush’.